We love the holidays – but the “hustle and bustle” is no joke. From shopping to cooking to wrapping (and wrapping and wrapping), there’s always something to do and somewhere to be. It’s a total crush, sure, but we wouldn’t have it any other way – and that’s why we’re loving December’s Product of the Month – Nuckees™. Scratching your head yet? Don’t – you’ve likely seen these go-anywhere, do-everything smartphone accessories. These small grips attach to the back of your device, making it easier to hold your phone, especially when you’re on the move – i.e., right now. Make your list, check it twice, then always have the perfect grip on your must-gets with a Nuckees. With SnugHug Technology, it’s easy to attach a Nuckees to any device. Then, with a quick POP you’ve got a rock-solid grip – that means no risk your phone will slip, fall and crack this season. Because, let’s face it, a cracked screen can put a serious damper on any shopping session. That, isn’t the only travel-friendly perk. Nuckees make it easy to wireless charge your phone on the go or attach your device to your dashboard before starting GPS mode. You’ll never get lost – and never have to take your eyes off the road again. Bonus. 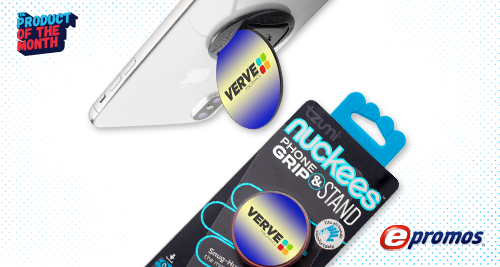 In that vein, why not pop out your Nuckees “stand,” queue up a YouTube how-to tutorial and get cooking or wrapping? With your hands free and your phone in an optimal viewing position, it’s simple to follow along with the pros and ensure your crème brûlée – or festive bows – are holiday-ready without the stress. Heading to a holiday party? Again, it’s all about the four-way locking stand. Get your Nuckees stand into “ready” position, then click on your favorite playlist. Because the screen is visible, you can change tunes, swap players or, even let guests DJ with a quick click or two, without ever losing sight of your phone or what songs are coming up next. And, of course, there’s the grab-and-go aspect – the original reason we’re all about Nuckees. Once “popped,” keeping a grip on your phone is easier than ever, even if you’re wearing gloves and even if you’re juggling the cookies, the gifts and everything in between. If a Nuckees can keep us from losing grips – and breaking our beloved smartphone during this go, go, go season – we’re all about it. These gifts are the ultimate must-have this holiday season – and with your branding attached, you’ll get added eyes and be forever tied to that favorite gift. It’s a win/win, and a great way to help everyone on your wish list keep moving during these next few weeks, and beyond.